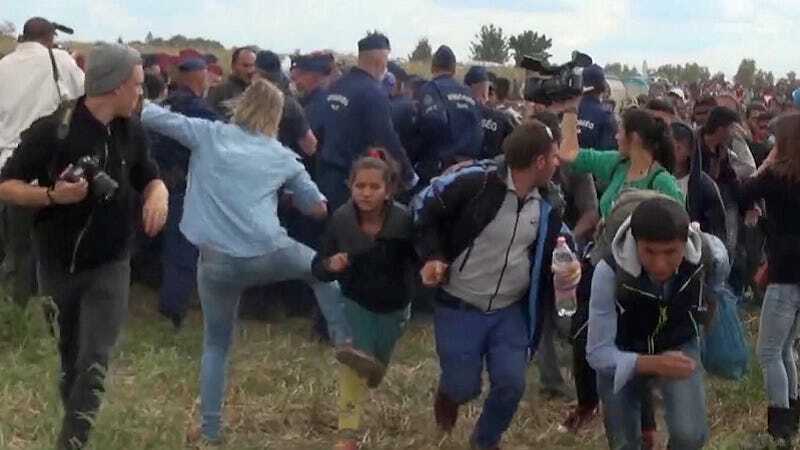 Petra Laszlo, the camerawoman for Hungarian news station N1TV who was filmed kicking and tripping refugees at the Hungarian-Serbian border, plans to sue both Facebook and one of the refugees whom she kicked. Laszlo said that once her criminal trial is over, she intends to file the two lawsuits, according to an interview with Russian newspaper Izvestia. Laszlo told Izvestia that she plans to sue Facebook for allegedly refusing to remove threatening groups on the site while deleting groups that supported her. She has also directed her anger towards Osama Abdul Mohsen, one of the Syrian refugees she kicked, and says she plans to sue him. In the interview, Laszlo implies that Mohsen is lying about the incident though it’s clear in the video that she kicks him. He’s the man holding the young boy yelling, “baby, baby, baby!” as he tries to run past the border. There are few things less heartbreaking than watching the desperate Mohsen fall on his small, crying son. Mohsen later said that his seven-year-old son, Zaid, suffered a concussion from the fall. The lawsuit seems to be a change of tack for Laszlo. After N1TV fired her, she said in a letter to Hungarian newspaper Magyar Nemzet that she “honestly” regretted her actions. “I’m not a heartless, child-kicking racist,” she wrote. Perhaps the only silver lining to this story is that Mohsen was offered a job at a soccer school in Spain. Authorities in Madrid are working to reunite Mohsen and his son with the rest of their family who is currently in Turkey.